Film Noir has truly left its mark on the face of cinema. Cynical attitudes, harsh contrasts, femme fatales, rugged detectives, plenty of cigarettes, and sexual motives, epitomize the once viral cinematic form. The uniquely stylized “genre” of Hollywood crime drama has managed to stay very much alive through modern day representations in mass media. In 2011, Rockstar games came out with the popular crime drama video game, L.A. Noire. 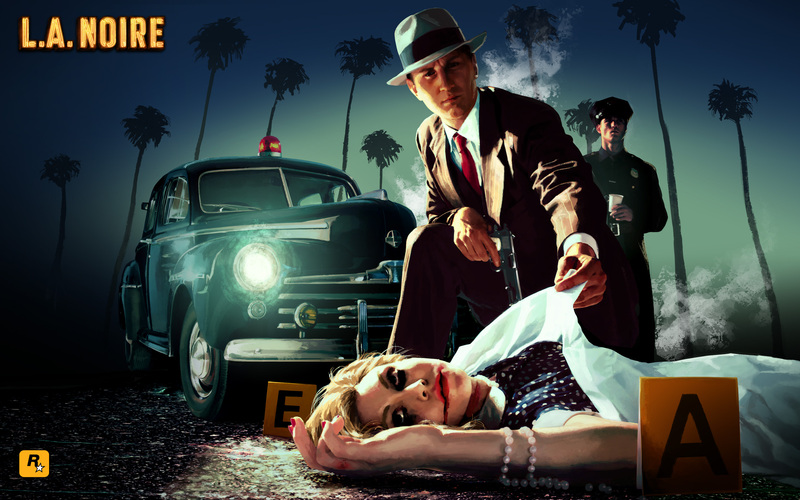 L.A. Noire blends investigative elements such as mystery and crime solving, with fast-action situations, including car chases, hand-to-hand combat, gunfights, and interrogations. The game quickly earned attention and eventually became one of the best games of the year . Soon after its release, the dramatic crime thriller was chosen to be shown at the Tribeca Film Festival, interestingly the first video game to be entered and accepted by the festival (vg247.com). The aesthetic elements draw heavily from the imagery of classical hollywood film noir. The game does a great job mimicking “dark” lighting, almost always casting a shadow, with the right balance of darks and lights. 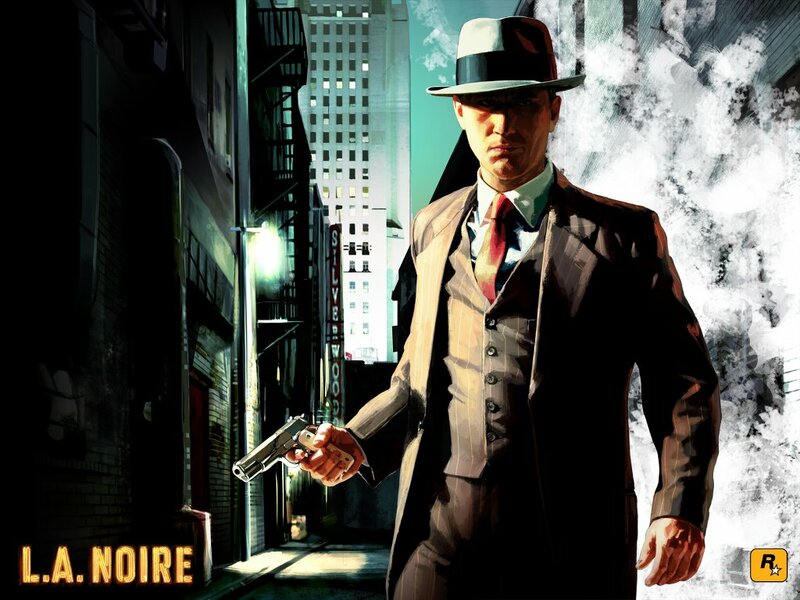 It is obvious that the shots directly mimic that of Film noir, though the video game’s incorporation of graphic colors seem to introduce alternate moods that the noir period could not capture. It is my opinion that the success of this game is largely due to its representation of the ” dark visual style and black vision of despair, loneliness, and dread (Porfirio 80)”, that film noir so deeply encompasses. This participatory form of media re-creates and regurgitates this visual theme, in my opinion, perfectly. The game really defines itself as a neo-noir artifact, simply because of CGI and modern graphics. Otherwise, i’d say its almost exactly identical in visual style, and even in structure. The protagonist, Cole Phelps, plays the niche of an L.A. police officer and later detective. The whole storyline of the game revolves around this one subject, following his path through his career as he deals with various cases. Both the gamers of L.A. and viewers of film noir are able to watch their “hero” take abuse, get into trouble, or even stumble into a sexual encounter, and be able to identify and grow with that character. Our not-so-heroic hero mirrors that of the noir protagonist’s status, as he is constantly “subjected to brutal stresses and strains”(Christopher 17). Intended for the demographic of young to middle aged males, L.A. Noir does a sound job at re-creating the structure of the game through the eyes of a man, for men. Ultimately, L.A. Noir is able to ignite a sense of “shared human responses” within the participator’s own psyche (Porfirio 81). For most of today’s video games, i think it’s safe to say that this isn’t the easiest thing to achieve. Interestingly enough, TNT has recently ordered a pilot for their new drama series…. L.A. Noir. produced by former Walking Dead showrunner, Frank Darabont. Although there are many modern artifacts out there today that border on the line of noir, it will be a very different perspective to see true noir packaged into a TV series format. Since its creation from German expressionism, film noir continues to grow and transform, jumping from medium to medium, constantly re-surfacing within various artifacts throughout the world of media today. If you haven’t played the game i suggest you do, however if you want to see more about how the game looks overall check it out right here! Having played this game I found this post to be of particular interest to me personally. I definitely agree with Taylor in terms of the way the game is presented, both stylistically in terms of the tone and setting, as well as how the central gameplay mechanic revolves around searching crime scenes and solving cases. My experience with the game was one of constant bewilderment and frustration, this was based partly on the fact that I wasn’t at all good at reading characters for when they were lying, which was a central part of succeeding. All told however, LA Noire presented me with a deeply engaging narrative set in 1940’s era Los Angeles, with groundbreaking facial animations to boot. I would also suggest to anyone else interested to check out other Rockstar titles including Red Dead Redemption, Max Payne 3, or Grand Theft Auto 4. All of these titles present players with noir-esque anti-heroes who’s central narratives also mimic that of a noir lead. Plus they are amazing games. You pretty much hit the nail on the head with this representation of noir. I have never played the game, personally, but I watched the youtube clip you provided and I agree with you and Easton completely. The sheer aesthetic element is obvious in terms of dark shadowing, 40’s era, the music, and the acting is even similar (B-acting). However, I’m curious about the anti-hero theme. Just from watching the video, it seems like the person who is narrating and is central to solving the crimes is a police detective — someone who isn’t crooked. Since I haven’t played the game, does the detective lie to his higher authority similar to Marlowe in The Big Sleep? Easton, you mentioned that it is difficult to distinguish whether a suspect is lying or not. Curious, do you need to use strict evidence to tell whether they’re lying or do their facial expressions actually give you clues to their lying like they would in real-life? To answer your question Ashley I believe you have the opportunity to search the crime scene before you question a witness, which can lead you to clues that may or may not help in questioning. On the easier difficulty (the one I played) includes certain sounds/tones which indicate whether or not you picked the correct reply when questioning a suspect, while the harder difficulty is based solely on how the person reacts facially to questions. Regardless I was never very good at that particular aspect of the game, which led to many a botched case. The only solace I might take out of the game is that I was decent at the driving bit and managed not to cause the law abiding tax payers of Los Angeles too much pain. This is apparently the bit that Brett was bad at. It’s ok though, I’m sure once he got to the crime scene he was much more effective than myself. I’ll admit it was hard for me to do the questioning part well also – lots of successful missions with one star or whatever the measure is, because I kept messing up the questioning part but put the crook away anyway. As for the anti-hero, the character you play has a checkered past that figures into the way other characters interact with him. You can choose how open/honest you want to be with your superiors, both about that and about the cases you bring in. Plus, your direct boss in Homicide is a Piece of Work: he’s this loud-mouthed Irish cop who has no qualms about bringing in suspects on essentially trumped up charges if his gut tells him this is the guy. There’s a lot of corruption going on, that’s for sure.